My immediate thought was different: have a major depression, and weaken Unions so more workers join the 32% of below-current- poverty-line whose main income is paid employment. Then the dole will be above that definition of poverty, while the executives stay on salaries giving over the poverty level weekly income per executive hour! Australia’s Newstart Allowance (single person over 22 unemployment benefit) currently is at best about $335 per week, including rent assistance, and the Government is proposing to cut the Energy Supplement from it – about $8 per week. That is why I keep calling for those on welfare to have the right to surrender 90% of their income for guaranteed, supervised basic living provided by the Government. 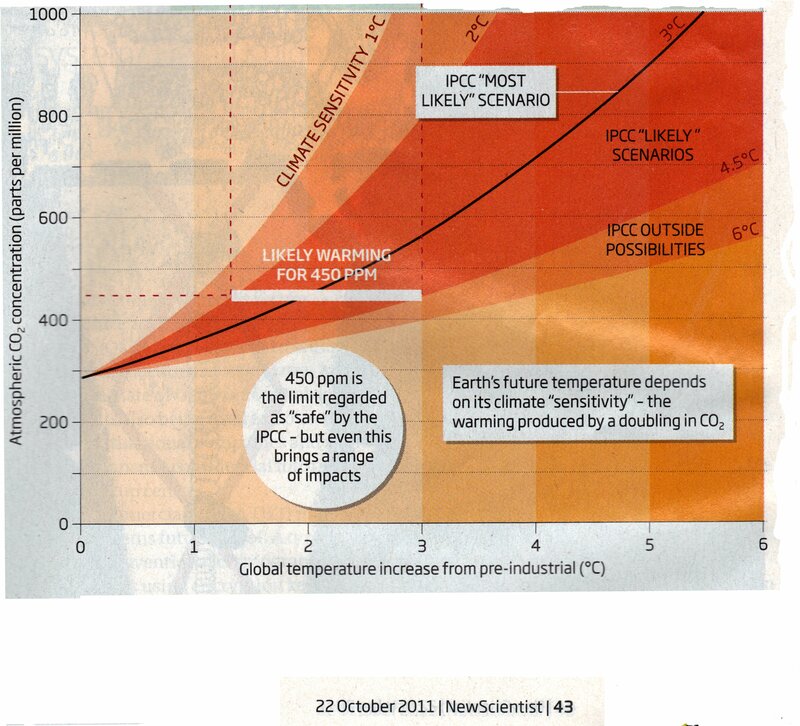 The New Scientist had a graph, reproduced below. It struck me as a good teaching example, both as a source for examining the effects of presentation choices on interpretation and as a trigger for discussion on the distinction (if any) between persuasive writing and biased writing. What does this graph show ? How does it make you feel about increasing CO2 levels? What title do you prefer at present? – place the in-graph labels for “likely Scenarios” “Outside possibilities” and “most likely scenario” so that they are in the same visual spaces as in the original. What title would you give it? Does it make you feel the same way about increasing CO2? Compare the two graphs. Which do you prefer? Why? New Scientist has been accused of being biased in its presentation of the science concerning climate change. Does the published graph cross the line between science reporting and biased writing? Is there a distinction between persuasive and biased writing? Is there /should there be a line between science reporting and persuasive writing? Why / why not? Take a four-year trained Primary teacher in Western Australia on a starting salary of $56 122, rising to $61 567 after a year of service (the latter is the starting salary for a five-year trained teacher). They have the same school hours, but the teacher is expected to be present before and after school to open and close the class, meet parents and students, do required bureaucratic work, deal with emails, write up the daily workpad, and so forth. In addition, a teacher has to work out of school hours to complete important duties such as: prepare and change programs and lessons to meet the students’ needs; attend professional development; represent the school in out-of-hours activities; do professional reading; explore, collect, and document useful materials for activities;, contact parents; mark assessments; and write student reports. I have heard teachers say that they regularly do over twenty hours per week out of school – that is, beyond the minimum of five hours at school before and after class, and the DOT time in school. This does not include preparatory work done over school “vacations”. First-year teachers are told to expect much longer hours, often eighty hours a week. To be conservative, let us assume the new teacher is a genius and can get away with a term-time weekly average of the five hours at school and twenty-five out of school, and donates vacation time. So, for the first two years (ending on $61 567), the new genius teacher can expect an effective hourly rate below that of a new Education Assistant. Less organised and gifted teachers would receive much less. Note that I have made conservative assumptions on hours worked; have had the teacher donate some holiday time; have not made deductions for the purchse of professional reading, professional training, and class materials; and have not included double time for work on Sundays, although many conferences are scheduled for weekends and most teachers do some work on Sundays throughout term. Teachers aren’t in it for the money. As I noted previously, Australian teachers’ pay relative to Average Weekly Earnings (and relative to backbenchers’ pay) has dropped massively over the past thirty years. If the schools can’t afford to pay teachers more per work hour than unskilled workers, then Teachers’ Unions must demand that society as a whole regulates for extreme courtesy¹ towards teachers: students, parents, and bureaucrats must recognise teachers’ years of training, specialist knowledge behind decisions, advanced diagnostic skills, and out-of-school workload, and the complex challenges teachers face, and reflect this in their approach to individual teachers on individual issues. You can’t afford to pay the teachers what they are worth. Recognise the imbalance in social obligation: you owe them, big time. ¹: Courtesy is the behaviour, respect is an internal state. It is impossible to coerce people to have respect – one can only coerce them to produce the socially defined behaviours indicative of respect. I believe that it is time for some coercion.